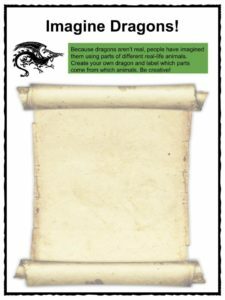 Dragons are mythological creatures that have existed in folklore of cultures all over the world for thousands of years. In Western culture, the imaginary creature is typically described as a giant four-legged reptile covered in scales that is able to breathe fire and able to fly with powerful bat-like wings. In Eastern cultures, the dragon is represented as a highly intelligent serpent-like creature without wings. They can be either benevolent or malevolent. In symbolism, dragons represent luck, power and strength, but can also represent greed. 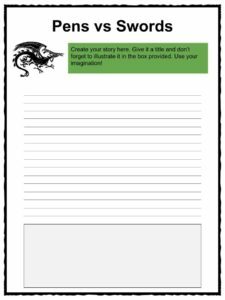 See the fact file below or download our BUMPER Dragon worksheet collection which includes over 20 pages of worksheets and activities for the classroom or home environment. The English word ‘dragon’ emerged in the 13th century and comes from the Latin word ‘draconem’, meaning ‘huge serpent’. The Greek word ‘drakon’ also means ‘serpent’ or ‘giant seafish’. 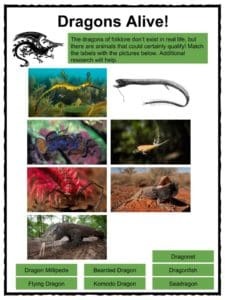 Because dragons don’t really exist, anthropologists suggest that the idea of dragons came from ancient discoveries of dinosaur fossils and an evolutionary fear of snakes and other dangerous reptiles. 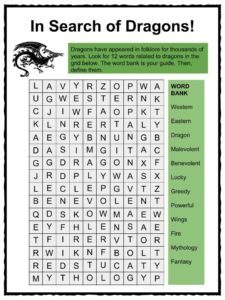 In ancient Mesopotamia, dragons, as we know them today occurred in literature as either benevolent (doing good) or malevolent (doing bad) creatures. It was depicted as a mixture of lion, eagle and scorpion and associated with weather gods. For the ancient Egyptians, the god of chaos, Apep, was depicted as a giant serpent and lived in the underworld. Thunderstorms and earthquakes were believed to be his roar. The ancient Greeks and Romans believed dragons had supernatural powers. The first mention of a dragon was in Homer’s Iliad. Dragons in their literature generally brought death and chaos and slayed by gods and demigods. In Germanic and Norse mythology, dragons are depicted as giant sea serpents. They encircled the realm and the sea around it. For the Old English, dragons were depicted as greedy hoarders and, in the epic poem Beowulf, a sleeping dragon is awakened when a cup is stolen from its pile of treasure. It then goes on a rampage. In Medieval Europe, the idea of dragons reached its height and they were believed to be living creatures, like other mythological creatures such as unicorns. Dragons were malevolent and pillaged sheep flocks and mercilessly destroyed villages. St George and the Dragon is arguably the most famous narrative of dragons of this time. 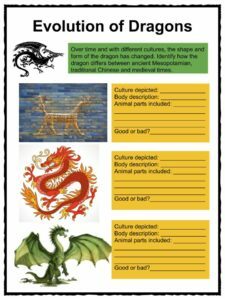 Dragons have existed in Chinese culture and folklore for centuries. It is the highest-ranking animal in Chinese animal hierarchy. It is typically snake-like with four legs. Chinese dragons are symbols of luck, power and strength, but only to those who deserve it. They are believed to have control over rainfall, typhoons and floods. In Chinese culture, people of excellence and outstanding achievement are likened to dragons, while the opposite are likened to worms. The number nine in Chinese culture is very lucky, linked to heaven as well as dragons. For the ancient Japanese, dragons were regarded as water deities similar in appearance to Chinese dragons. They were bringers of destruction, however. In Japanese lore, dragons could be appeased with precious metals and also killed with metal. Dragons in modern times are popular creatures of the fantasy genre. They are generally portrayed as malevolent creatures. Some of the most famous modern depictions of dragons in literature include Lewis Carroll’s Jabberwocky from Through the Looking Glass (1872), who was a helper. J.R.R. Tolkien created one of the most famous dragons in literature, Smaug, who appeared in The Hobbit (1937) and The Lord of the Rings (1937-1949). Smaug is depicted as a powerful, fearsome and greedy dragon who takes over a dwarf kingdom. Dragons are used as transport for ringwraiths in J.K. Rowling’s Harry Potter fantasy series. 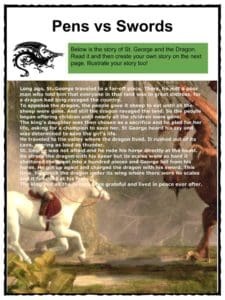 Dragons also feature in the books and TV adaptations of George R.R. Martin’s Game of Thrones. They are Drogon, Rhaegal and Viserion. The popular animated film How to Train your Dragon (2010), based on the book series by Cressida Cowell (2003-2015), features a menagerie of dragons, including Toothless, a night fury dragon. Here, because of ignorance, dragons are initially believed to be destructive pests until Hiccup teaches the villagers or their benefits and true character. From the Eragon movie (2006), the animators of Saphira were inspired by various animals, such as puppies, wildebeests and eagles. The Welsh flag depicts a red dragon on a green and white background. A flower called a snapdragon is named because its shape resembles a snapping head of a dragon. Dragons in French history were used to represent the victory of Christianity over paganism. In Feng Shui, the dragon is a powerful symbol of yang/male energy. In China, the dragon dance is performed by a team of people who move a long, curving dragon through the streets in celebration of the Chinese New Year. 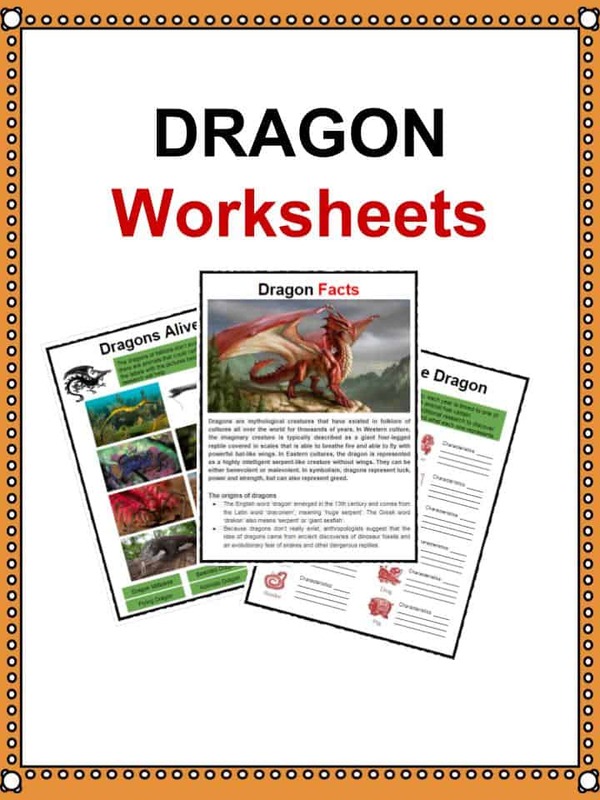 This bundle contains 20 ready-to-use Dragon Worksheets that are perfect for students who want to learn more about Dragons who are a much-loved mythological animal that are gigantic, powerful snake or reptile-like creatures. They have appeared in mythology throughout the ages and are especially popular and cultural in China.